The federal government is determined to build the Trans-Mountain pipeline expansion. For the Liberals, $12 billion, trampling Indigenous rights, and increasing climate chaos is the price they are willing to pay to defend profits for oil companies. 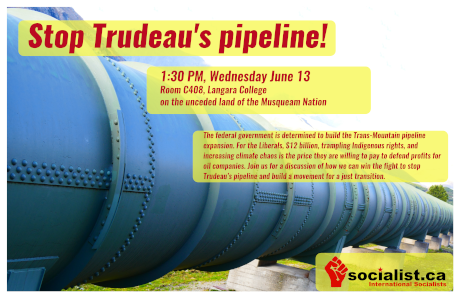 Join us for a discussion of how we can win the fight to stop Trudeau’s pipeline and build a movement for a just transition.